The very largest of what were predominantly medium sized Crisps, sustained its crunch throughout the eating process, but it did gradually decrease in strength until it succumbed. The Crisps were not as hard as some batch fried Crisps, but they were certainly more crunchy than almost all regular Crisps. 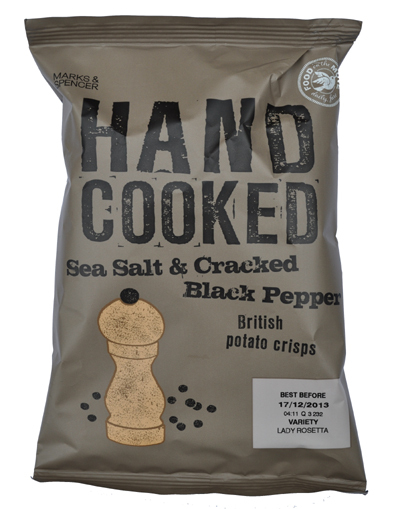 The first thing that hit us when opening this bag was the flecks of Black Pepper that were visible. There were not lots, but there was enough to hint at an accurate flavour description. There were not as many curly Chips as can usually be found in a bag of Hand Cooked Crisps. The colour was a sort of yellowy oil, if there was such a thing. There was also skin visible on most edges. A Nose Plunge Test revealed an oily Pepper aroma. There was a fairer balance between the Salt and the Pepper taste, which was good. However, the overwhelming flavour was oily potato.